As the standard of Jewish Theological Apologeticism in the 21st Century, (maybe Rabbi Nosson Scherman is of the 20th Century), please explain why we make all high-profile visitors to Yad VaShem (and the Western Wall) cover their heads for the photo-ops. Perhaps another contest is in order? Furthermore, why make him wear an ugly white cardboard kipah that shines out of place? They can't give him a nicer one (with extremely expensive Jewish, not cheap Arab, labor)? 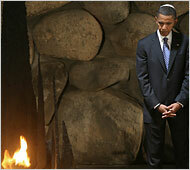 Is Yad VaShem a synagogue? Last time I checked we don't force men tocover their heads at all musems! While we are on the slippery slope, to be fair, why don't we make female dignitaries cover their head for these photo ops? Would a church clergyman make a Jew wear a Christian symbol at one of their functions? Maybe a kippah is equivalent to a cross in their minds? While I have th floor, I think a much more powerful message is a photo-op at the detention center in Atlit, where the civilized Gentiles held Jews hostage while their relatives were being exterminated in Europe. Are non-OJs welcomed at Ohel? If you're an MD what's so special about the GOP? Has "presumptuous" become the new "uppity"? How many missles do you see? Oh. Did Jesse Helms die?